While media outlets are suggesting climate change is to blame for exacerbating Hurricane Harvey's conditions, a much worse hurricane hit Texas more than a century ago—before Americans drove to work. The media have been quick to blame climate change for the devastation, which as of this writing has resulted in 30 flood-related deaths. Politico magazine declared "Harvey Is What Climate Change Looks Like." The Washington Post attempted to blame President Donald Trump's "climate skepticism" for more storms in the future. The Guardian said, "It's a fact: climate change made Hurricane Harvey more deadly." NPR reported the storm's size and impact "points to climate change." Environmentalists have often told Americans to become vegans to stop climate change, to "fly less, drive less, and eat less meat" and have fewer children to save the planet. There was a time when Americans were not flying, and hardly any were driving. And the storms were worse. The Galveston Hurricane of 1900 was the most deadly natural disaster in American history, which led to an estimated 8,000 deaths. Kevin Murnane writing for Forbes notes the many similarities between Galveston and Harvey, including that both were category 4 hurricanes when they hit landfall off the Texas coast. Winds from Galveston were faster, at 145 mph compared with Harvey's 130 mph, and its height of the storm surge was 15.7 feet, also higher than Harvey. The lack of technology certainly impacted the high death toll in Galveston, as residents had no warning the storm was coming with no weather tracking services. The rest of the country did not learn about the deadly storm until days later because of no reliable lines of communication, delaying aid efforts. "One critical difference between the two hurricanes lies in what happened in the days after the storms hit," Murnane explains. 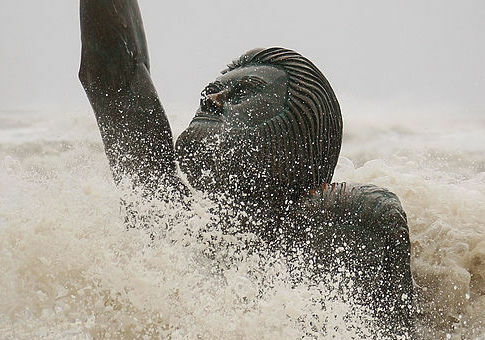 "Galveston experienced sunny skies and a 20 mph wind the day after the storm. The storm continued overland to the west until it turned in a great horseshoe and exited the U.S. through Michigan. Harvey has stalled out and is deluging eastern Texas with torrential rain, dangerous flooding, and tornadoes." Harvey has led to a new record of rainfall in the continental United States, topping over 51 inches. Environmentalists and the media claim this is due to man-made climate change, leading to sea-level rise and higher water temperatures in the Gulf. Many media reports blaming climate change for Harvey used Michael E. Mann, a professor at Penn State and author of the controversial global warming "hockey stick" graph, as their source. Mann's graph was widely used in the late 1990s to connect human activities to global warming. Mann was later found to have "exaggerated" the impact of global warming in the graph by using "inappropriate methods." While careful to say climate change did not directly cause Harvey, the Washington Post said it "exacerbated the storm conditions," linking to a piece written by Mann in the Guardian, calling it a "fact" that climate change made Harvey worse. "Human-caused warming is penetrating down into the ocean," Mann claims. "It's creating deeper layers of warm water in the Gulf and elsewhere." "Harvey was almost certainly more intense than it would have been in the absence of human-caused warming, which means stronger winds, more wind damage and a larger storm surge," he added. Mann ignores the fact that the Galveston Hurricane had a storm surge of 15.7 feet, higher than the 7- to 12-feet storm surges seen from Harvey. Man-made global warming is mainly attributed to carbon emissions, from industry and from transportation. There were only 8,000 vehicles in the entire country in 1900. Only 663 million tons of CO2 were emitted, compared with 5.333 billion today. Mann was also quoted in an article by Vox, which claimed climate change did not cause Harvey, but gave it its "winning personality." "Climate change does not cause things, because climate change is not a causal agent," Vox explained. "What caused the storm is warm air, atmospheric moisture, and weird high/low pressure systems, just like all storms," Vox continued. "Climate change just gave it its winning personality." This entry was posted in Issues and tagged Climate Change, Hurricane Harvey, Texas. Bookmark the permalink.